Until March 30th, 1963, there was no postal system in Abu Dhabi. Up until this point, all the post from the region was taken to Bahrain by charter plane. In March of 1963, the first British Postal Agency office was opened in Abu Dhabi. Many Arab countries, such as Iraq, also had British run postal systems. 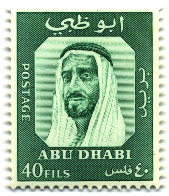 Definitive stamps for Abu Dhabi were issued starting March 30th, 1964 but were produced by the British Postal Agency. These stamps were valid for use as late as July 1966, after which the Sheikhs of Abu Dhabi took over the post offices. 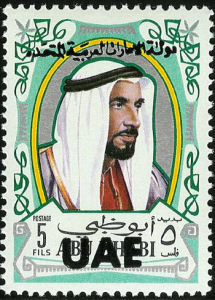 Abu Dhabi`s sheikhdom began to issue their own stamps starting January 1st, 1967. During the independent postal administration, 11 Abu Dhabi sets were issued with 55 different stamps. Abu Dhabi issued 95 stamps from 1964 to 1972. The final set of stamps had images of three views of the Dome of the Rock in Jerusalem. Other stamps depicted leaders such as Sheikh Khalifa bin Zayed Al Nahyan, and other images including falcons, camels and landscapes of the region. 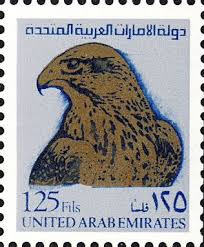 However, once the Gulf Sheikhs (including Abu Dhabi and 6 emirate states) decided to form the United Arab Emirates in December 1971, the United Arab Emirates stamps superseded those of Abu Dhabi in June and the Abu Dhabi definitive issue overprinted stamps with UAE.